Duchesnea indica. James H. Miller & Ted Bodner.www.invasive.org. USDA, NRCS. 2010. The PLANTS Database. National Plant Data Center, Baton Rouge, LA, USA. (Accessed 4/2014). 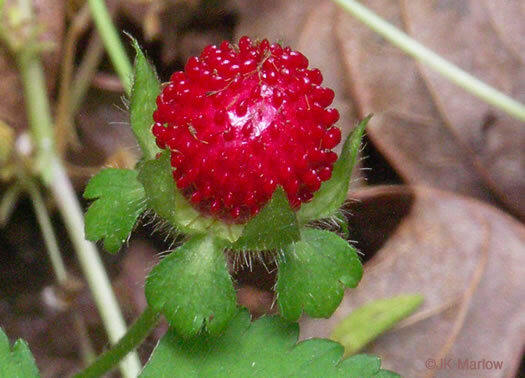 Duchesnea indica is a perennial herb, trailing, stems several from one root crown (Yatskievych 2006), aggressively colonial from runners, finely hairy, very similar in appearance to native wild strawberry. Duchesnea indica plant in fruit. © Copyright Steve Baskauf, 2002-2011. discoverlife.org (Accessed 4/2018). Leaves semi-evergreen, alternate, 3-parted, leaflets 2-5 cm long, 1-3 cm wide, margin with rounded teeth. Duchesnea indica flower close-up. Josh Hillman. Tallahassee. Florida Nature. floridanature.org (Accessed 4/2018). 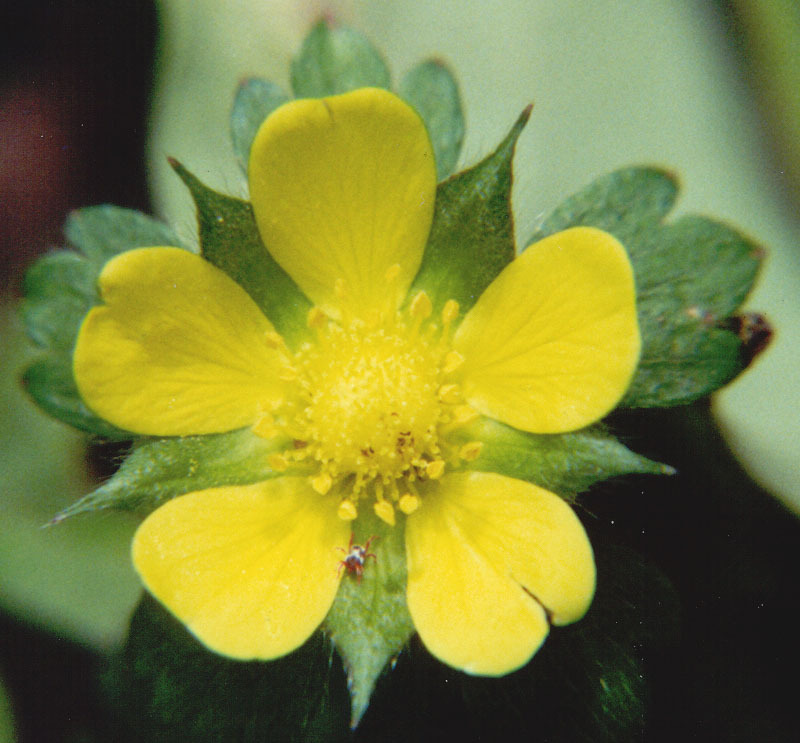 Flowers yellow, radially symmetrical, ca 1.5 cm wide, petals 5, sepals 5, green alternating with petals, stamens 20-25, pistils numerous, embedded in the expanded floral base (receptacle); floral parts above 5 large, 3-toothed bracts. Duchesnea indica fruit. JK Marlow. S. Carolina. 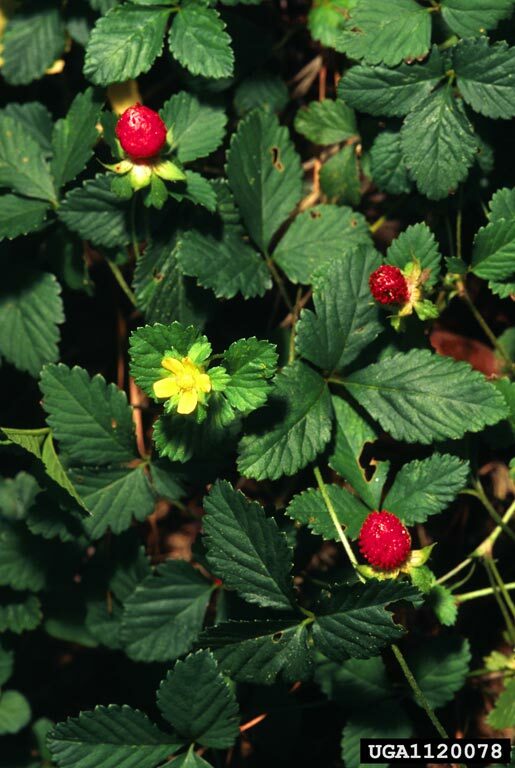 Native and Naturalized Plants of the Carolinas. namethatplant.net (Accessed 4/2018). 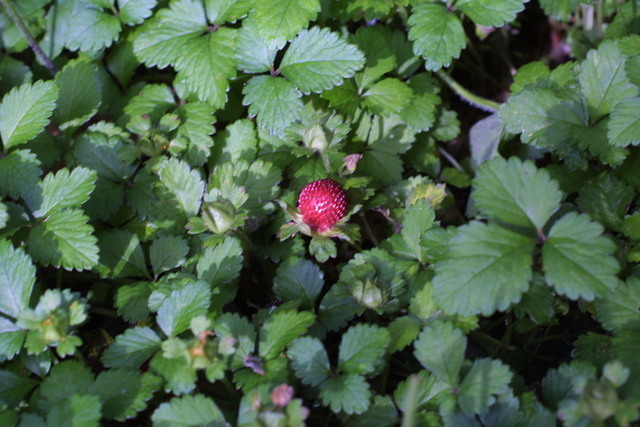 Fruit dry 1-seeded (achenes) on the surface of the enlarged, fleshy, red, strawberry-like receptacle; pulp lipid <10%, (White and Stiles 1992), eaten by many birds and small mammals; edible but rather tasteless. Habitat: light shade of disturbed woods, roadsides, meadows, lawns and gardens. Notes: May displace native species in forest understories.